See Gov. Sununu’s news release below. Molly grew up as the second of 11 children. She learned an important lesson growing up in such a large family: if one is to succeed, then all must succeed. And this is how she’ll govern New Hampshire – for one of us to thrive, we all must thrive. No one gets left behind. As a single mother raising three children, Molly worked her way through Keene State College — managing the family dorms, waiting tables at a pizza place and delivering newspapers in rural New Hampshire — so she could put food on the table. Kelly also worked her way through Franklin Pierce Law Center before working as a financial advisor, helping families create budgets and ensure they could take care of their families. Molly successfully ran for the state Senate for the first time in 2006, defeating a former state Senate president. She was re-elected four times. While serving in the legislature, Molly helped expand training and education for advanced manufacturing jobs. She served as Chair of the Governor’s Advanced Manufacturing Education Advisory Council, on the New Hampshire Rail Authority and on the Governor’s Commission on Alcohol and Drug Abuse Prevention, Intervention, and Treatment. Since leaving office in 2016, Molly has facilitated forums for the Center for Civic Engagement addressing challenges facing the community. 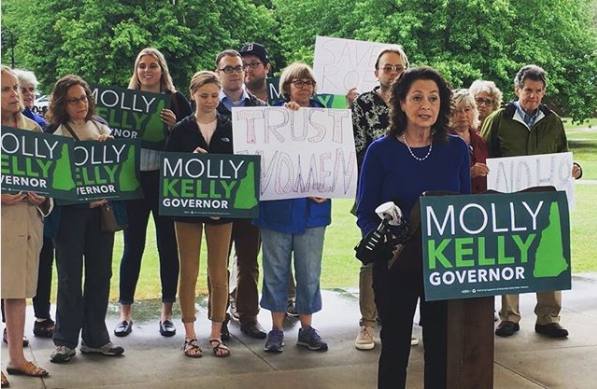 As governor, Molly will build a New Hampshire that works for everyone. Her record as a state senator is of a strong progressive committed to making a difference for people. That progressive track record will guide her leadership of our state. She’s stood up for public schools and students and championed women’s rights; Molly was proudly one of the first legislators in the country to vote for marriage equality nearly a decade ago. She advocated for common sense gun safety measures. And she’s always been there for working families. Put simply, she’s gotten things done. And being progressive and fighting for these issues isn’t new to Molly. Molly believes we have not just an opportunity – but an obligation – to come together to win this race. Too much hangs in the balance for our students. For voting rights. For our state’s long-term economic prosperity. For the safety of our children. We have a lot of work to do, and Molly believes we will only put New Hampshire back on the right course if we work together. Molly has a daughter, three sons and seven grandchildren. She lives in Harrisville with her husband, Art Luptowski.